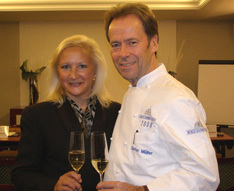 Luxury Experience Magazine had the good fortune to meet Chef Dieter Müller at the St. Moritz Gourmet Festival in Switzerland. This world-renowned chef is the first German chef with the highest GaultMillau rating of 19.5, and his Restaurant Dieter Müller holds the distinction of having 3 Michelin stars. Meeting with Chef Dieter Müller and having the opportunity to experience his cuisine was like watching an artist paint; you are not exactly sure how he does it, but the end result is a masterpiece. I met with Chef Dieter Müller throughout the six-day festival and fell in love with his Cappuccino with Curry, Lemongrass and Shrimp, which I tried during the Kitchen Party. Presented steaming in a demi-tasse with a skewer of shrimp, the cappuccino was a perfectly balanced harmony of flavors that defied guests to name the ingredients. When Chef Dieter Müller shared his recipe for the Cappuccino with Curry, Lemongrass and Shrimp, I learned the secret ingredients, namely Granny Smith apples, bananas, and pineapples! Who would think to put fruit into a cream soup with curry and shrimp? Chef Dieter Müller, of course! Method: In a pan, add the Noilly Prat, port wine, white wine, lemongrass, and lime leaves. Add the shallots, leek, and chicken stock and cook for 5 minutes. Add the cream, curry powder and curry paste, as well as the grated coconut and cook for an additional 10 minutes. Purée the apple, mini-pineapple, banana, and flat leaf parsley in a food processor and then add to the cream soup. Simmer everything together for 5 minutes. Pass through a cheesecloth, and while still hot, add the cold butter and stir. Sauté the shrimp with curry salt and pepper in hot peanut oil. Thread the cooked shrimp and the ginger on 12 skewers. Pour the hot soup into cups, add the shrimp skewers and cream foam. Degree of difficulty: Normal; Preparation time: 35 minutes.